Imagine that Vermont's gambit to pay out-of-state telecommuters up to $10,000 to settle here catches fire. It's not much more than a marketing stunt, but suspend disbelief for a moment: What if e-workers did come in droves? Would the hordes of pajama-clad work-from-homers unite and seize power? 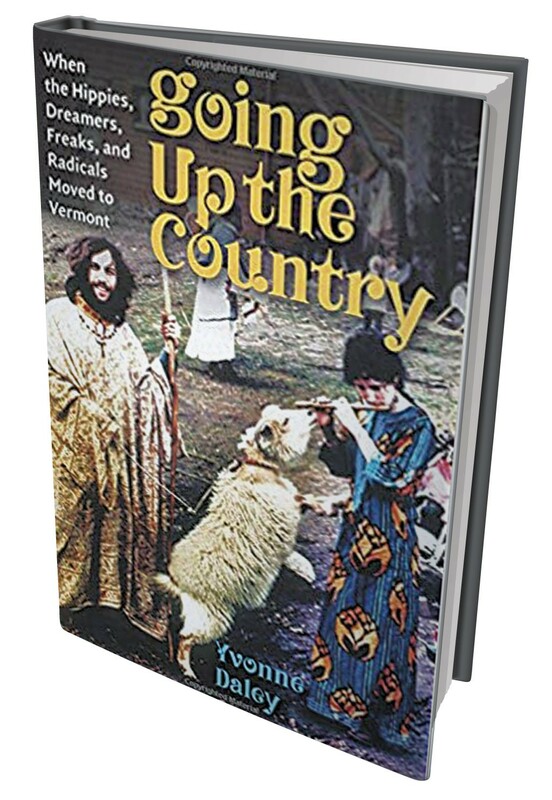 If the idea of Vermont as a mobile-professional mecca seems remote, read Yvonne Daley's timely Going Up the Country: When the Hippies, Dreamers, Freaks and Radicals Moved to Vermont. The fourth book by a former longtime Rutland Herald reporter, it chronicles Vermont's last great mass migration, the so-called "hippie invasion" of the late '60s and '70s. That influx, coming after decades of population stagnation, also seemed improbable. According to Daley, "By 1970, approximately 35,800 hippies were estimated to be living in Vermont, representing 33 percent of the total population of 107,527 Vermont residents between the ages of eighteen and thirty-four." The Rutland-based author was one of those back-to-the-landers. Her book weaves the young transplants' stories with analysis of the impact of this great migration on Vermont's politics, culture and economy. As Daley notes, the émigrés steadily turned a state that had been solidly Republican into the progressive bastion that eventually launched the presidential campaign of Sen. Bernie Sanders (I-Vt.). Over time, some socialists evolved into savvy and socially conscious capitalists. They gave birth to organic food and craft beer and green energy movements that today are integral to Vermont's brand and big drivers of its economy. Daley explores other changes wrought by the new arrivals, too, including the flourishing of the music scene, the advent of women's health clinics and the newcomers' demands for stepped-up government services, such as better roads and schools. Daley's gaze does not overlook the darker side of the influx, including misogyny and drug abuse at some of the communes. She also explores tensions that endure today between natives and flatlanders, conservatives and liberals, and urban and rural folk. Indeed, many who've watched Vermont change report feeling colonized. "The irony is that the people who came here espousing freedom turned into the controllers," Daley quotes Thetford conservative and two-time unsuccessful gubernatorial candidate Ruth Dwyer as saying. "They won, we lost." Dwyer and others might be encouraged by Daley's observation that nothing lasts forever. From Millerites to Swedenborgians to Garrisonians, utopian communities and reformist movements have come to Vermont, made waves and then disappeared. "It all seemed like a good idea — the dome, the teepee, the house with the root cellar — these were a response to the rigidness of the fifties," one now-adult child of a hippie told Daley. He lives in Texas. "My generation discovered that there's not a huge job base in Vermont and taxes are high, so it's hard to stimulate business." Daley's book makes one ponder the changes telecommuters are already making locally, as well as the accommodations the state might make for them in the future. In some quarters, there is already fierce debate about whether globe-trotting selectmen should be able to attend meetings via Skype. Going Up the Country suggests a new migration might well bolster Vermont's prosperity, reshaping its communities and lifestyles in unexpected ways. The original print version of this article was headlined "Quick Lit: The Hippie Takeover"